Welcome back. Walking my usual afternoon route about a month ago, I noticed a dead deer partially hidden by snow. It was on a trail, about 20 feet off the road. I suppose the deer had lost an encounter with a vehicle. There are various creatures that would compete with the town’s maintenance department for new roadkill, but I suspected this carcass would be of interest only to vultures. And having seen a recent study of how vultures are unique in surviving such unsanitary meals, I hoped they’d claim the prize, though they’d let me down once before. People sometimes complain that their work environment is like a zoo. I never had that problem, though for a brief period in my government career, visiting my 6th floor office was like visiting a zoo’s bird house. Vultures had discovered the narrow, alley-like roof space between our tall section of the building and an adjacent tall section without windows. Perhaps because they were enamored of their reflection in our tinted windows, they would perch there and preen and stretch their enormous wings. They were fascinating. My only other encounter with vultures--the time they let me down--I had already retired. Opening the front window drapes one morning, I saw a vulture on the street in front of our house. There was no doubt why he or she was visiting our quiet suburban neighborhood. On the pavement was a formerly live squirrel that thought the bounty was greater on the other side of the street. 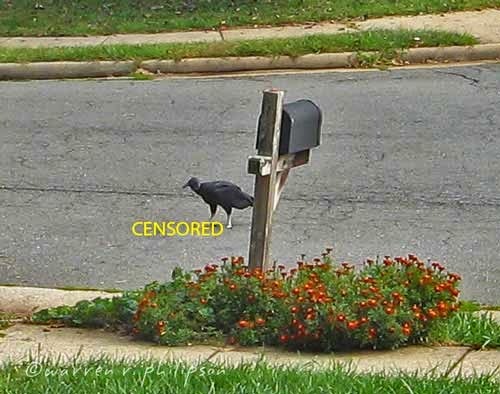 I watched, trusting the vulture would remove or otherwise dispose of the residuals. Repeatedly discouraged by passing vehicles, big bird finally surrendered and flew off (in the direction of my former office), leaving the task to me. But that's another story, and I'd better get back to the latest research. In an effort to fill the gap in our understanding of the digestive system of New World vultures (members of the Cathartidae family), collaborating researchers from Denmark’s University of Copenhagen, Copenhagen Zoo, Technical University of Denmark, Natural History Museum and Aarhus University, and the Smithsonian’s National Museum of Natural History examined the microbiome of 50 turkey and black vultures from the US. You, of course, are thinking, better them than me, but their findings are enlightening. 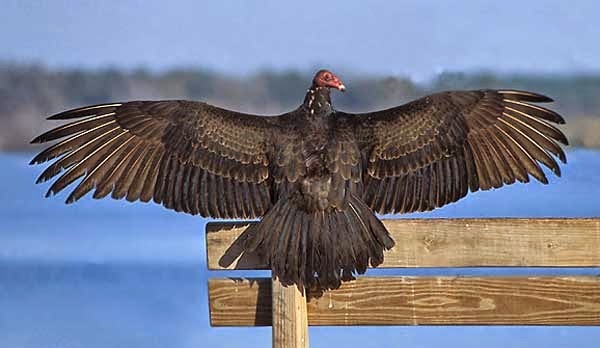 And the vultures’ gut microbes were dominated by such disreputable characters as Clostridium, noted for botulism, gangrene and tetanus in humans, and Fusobacterium, associated with periodontal disease, skin ulcers and colon cancer. The ability of vultures to thrive on a diet that would sicken or kill other vertebrate suggests their digestive system evolved to (1) destroy most of the bacteria they consume and (2) selectively tolerate or possibly encourage certain otherwise toxic bacteria. What an ideal gastrointestinal tract for a member of a clean-up team!